Sauron Defeated is Book IX in the twelve-volume series of writings known as The History of Middle Earth, a collection previously unpublished (and mostly unfinished) writings by JRR Tolkien. Tolkien’s son and literary executor, Christopher Tolkien, edited the series, collecting and providing commentary his father’s “lifelong works”. Sauron Defeated is the ninth volume in the series, and the fourth and final volume addressing the early drafts of Tolkien’s beloved masterpiece, The Lord of the Rings. 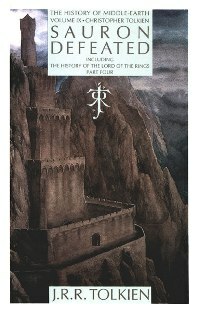 The first three volumes addressing The Lord of the Rings: The Return of the Shadow, The Treason of Isengard, and The War of the Ringhave taken the narrative up to the point where the ‘Battle of the Pelennor Fields’ is complete, and the remaining forces of Minas Tirith have gone to the Black Gate to challenge Sauron. Tolkien had not yet begun to tackle the voyage of Frodo and Sam from Minas Morgul to Mt. Doom, and that is where the narrative strand is picked up in Sauron Defeated. The end of the quest, the dropping of the Ring into the Cracks of Doom, had been vaguely mapped from almost the beginning of the novel’s composition. The idea of the destroying of the Ring in “Sauron’s fire-well” emerges almost as soon and Tolkien begins to realize the significance of Bilbo’s ring. More important details of that climax also appear in very early notes and drafts…that of Frodo’s final refusal to relinquish the Ring and of Gollum’s appearance and demise. And yet, in spite of this seemingly early committal to the vital proceedings inside Mt. Doom, the final scene was anything but easy for the author to commit to. As Christopher Tolkien states in the book’s opening sentence – “Long foreseen, the story of the destruction of the Ring in the fires of Mount Doom was slow to reach its final form” (SD pg 3). JRR Tolkien agonized over the roles of Gollum and Sam in that final moment, when Frodo wavers on the brink and ultimately refuses to relinquish control of the Ring. One outline, written when the fellowship had reach Moria, consisted of Sam “hurling” Gollum and himself into the pit, destroying the Ring. Very Sam-like, but what a bummer of an ending that would have been! There are several other very interesting variations on the final text from this point, particularly in “The Scouring of the Shire”, a section of the novel that Tolkien felt was of extreme importance and had foreseen for some time. Yet the first versions of this chapter are far different from their final drafts, and the roles and resolution of individual characters much changed. In the early drafts of the chapter, Frodo plays a far more extreme role in the battle with the ruffians, to the point of slaying their chief, ‘Sharkey’, on the very steps of Bag End. Saruman scarcely enters the tale until later drafts. Also of significance in this volume is the unpublished “Epilogue” Tolkien wrote, known to many Tolkienists because of copies of the text made and circulated from the originals owned by Marquette University. The “Epilogue” takes place at the house of Sam Gamgee, as he is reading and having a discussion with his myriad children. The second part of Sauron Defeated deals with The Notion Club Papers, which I will address separately in a different article. Though it dates from the same time as the composition of The Lord of the Rings, it is entirely separate from that narrative. The Notion Club Papers date from late 1944 and 1945, and deal with the “time-travel” theme and the drowning of Númenor that Tolkien had abandoned in “The Lost Road”. It is an attempt, of a sort, the tie the Númenorean tale in with modern history and the legend of Atlantis.